You all know Dan Parent and Fernando Ruiz even if you think you don’t! 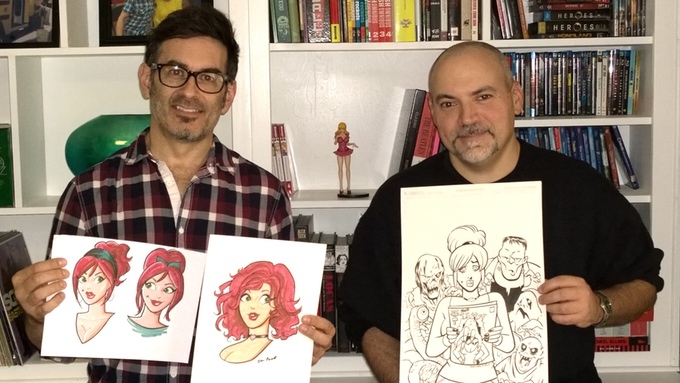 Dan and Fernando have been taking care of the Archie Comics characters for years now and this Kickstarter Korner is dedicated to their latest creator owned project, Die Kitty Die! By the time you read this on Wednesday, they’ve reached their goal, but that doesn’t mean you can’t contribute. On the contrary, the model for this Kickstarter is that the rewards get better as the stretch grows. Dan took the time to talk to us today about this very exciting new universe of characters and the world of Kitty Ravencraft, comic book hero and real life witch who is being hunted down by her greedy comic book publisher in Die Kitty Die! FOG! : Dan, congratulations on the funding, it looks like it is going pretty well so far! Dan Parent: Yeah, we’re at 71% (at time of interview) which is pretty good for our third day! We want to hit our goal but we want to go over because we are going to add more incentives, we’ll add pages to the book. The more money, the better the project gets. Tell those out there that don’t know, what is Die Kitty Die!? Die Kitty Die! is about a comic book character, who in our universe has been around for a long time and her sales are low. Her publisher asks, “What are we going to do to generate publicity or sales? We’ve got to kill her off”! In our world it’s a little different because in our world the characters are also real. So, they have to really bump her off. Not just bump her off in the story, they really have to get rid of her. Things get a little more complicated because Kitty is a witch, so how do you kill a witch? The publishers of Kitty Comics (because the company is based around her) go to a lot of their other characters that have fallen by the wayside and offer “Whoever can get rid of her, we’ll put you back in the limelight”. You have these different kinds of characters trying to off her. It becomes a contest. Of course there are a lot of other complications that ensue — ex-boyfriends and warlocks — it becomes a bit of a soap opera. Who can she trust? We go back in time, to read old Kitty stories to meet these characters. That sounds so fun, for a number of different reasons. First of all, that is the #1 strategy for comic book companies, killing off their characters. Why do you think they always go to that one? There are always a few things that get a lot of publicity. It’s even the same way in TV shows. You kill someone off. You get married. Sometimes a pregnancy works, too. That’s more of a TV thing, but marriage and death are the two big things. It’s a tried formula that gets ratings and viewers and readers. We just started making fun of that. What you are doing is a whole new twist that, with Kitty being an actual person. And some of these characters in the Kitty world are a bit familiar, so you get to comment on your more well known work in a way. I really like that. Yeah, you are going to see some characters along the way, like some super hero characters that will look kind of familiar but obviously we don’t want to rip anyone off. We’ve got a little ghost character who is a little Casper-ish but he is a different character. We’re just poking fun, we’re having fun with the whole comic book realm. 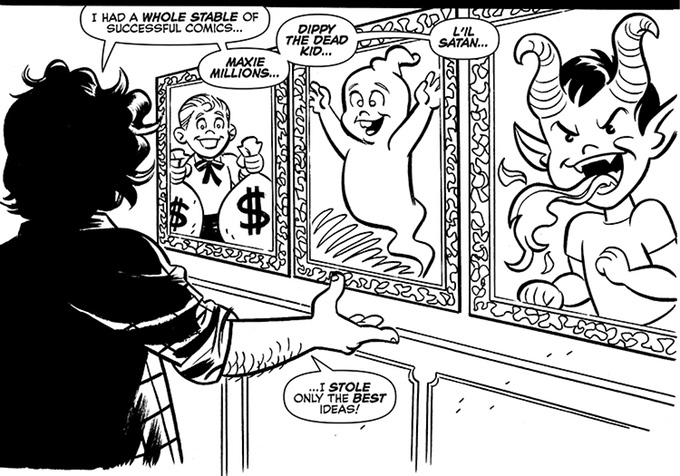 You have your own style that people love, the way you write and draw the Archie characters. It’s a chance to poke fun at and twist around what you have been doing for a long time and put your own spin on it. Right, Fernando and I were working at Archie for a long time so people know our own style that we draw from. We’re trying to change it up, to a point, but at the same time when people look at it they know our art style too. We’re consciously trying to not do it too similar to Archie and but at the same time we want people to know our style. And since you have been funded so easily, people are fans of what you guys do and are going after this thing already which is very cool. Are you and Fernando both writing and drawing? What are the split duties there? Yeah, we are both writing and drawing and splitting up chapters. We’re diving in. We’ve got done some sample pages up on the Kickstarter so people can get a grasp of what it looks like. We’ve both written a lot in our past and we both have pretty strong ideas about where we want this story to go. We write well together, things flow pretty evenly through the two of us. That’s really nice. When you launch a Kickstarter, how do you as creators come up with creative ideas for the stretch goals that are a little bit different? You’ve got a Darwyn Cooke cover and other awesome stuff coming our way. The Darwyn cover is part of the initial Kickstarter, so that’s a done deal. When we do the stretch goals, we will add more swag, buttons and novelty stuff like mugs. That kind of stuff. But we’ll also add that if we get to a certain level, the Softcover becomes a Hardcover. People who already pledged at the $25 level for the book and the PDF, they will automatically get the Hardcover without changing their bid. If you are in on it already, you get some of these rewards just by being part of it. So it just keeps getting better and better as the funding goes up? Right, and if we do add-ons, if we do some swag people like, they can add it to their existing pledge and they get that stuff too. One more before we go, it looks like this could be the star of something too, it could be a bigger universe. Are you guys planning on exploring these characters more after this Kickstarter is done? Absolutely, I think we have some really fun characters, we are creating a fun universe, we’re thinking about doing some web comics, building a site for it and more books too. Stay tuned for more add-ons and stay tuned to the updates for any artist announcements and more! To support Die Kitty Die!, visit the Kickstarter page HERE! Full-Length Special: You Win or You Die I hope you're happy now. So excited for this! Sounds like such a great idea and everything previewed so far is wonderful!